The percolator glass water pipes are about 12 inches tall. These water pipes have double Bub design and have one honeycomb percolator and dome or splashgard..
Pros: Looks and works beautiful. Best find&buy for my research. Cons: None/ Only petty scratches (sale price makes up for it and then some) for the critics. Pros: HUGE! Great big beaker glass base. Pros: Good size. Percolater works great and is cool looking. Best part is no water splashes up to your mouth. Pros: This is a beautiful piece, it came in perfect condition and is the color I reuested. It was exactly as advertized and had great shipping speeds and packaging. Comments: love gogo pipes, they are a extreamly reliable website. I can't wait to give this gift to my boyfriend! Pros: 11 to 11.5 inches tall. Smooth and hard hitting. Thicker glass than expected. Pros: I works great !!!! Pro pros man🍬🍭 I love it!!! Like pizza🍪and cake🍰! Or my three favorite things. Chicken pot pie!!!! Cons: Wish is was a little heavier on the bottom for ash catcher purposes. Not a con really though. No flaws in workmanship or detail! Comments: I love this company!!!! Pros: Amazing... i love this beast the hits are so smooth especially with the use of the ice catcher. You can take a huge rip without even realizing how big it really is because of how cool the smoke gets with the perk and ice catcher together. You can milk it forever. Love the design at the top. For my first bong, I am very satisfied! Comments: Shipped in 3-4 days i was impressed and it was my first order from gogopipes. I will definitely return for all my smoking needs. Pros: just got this bong yesterday milky hits the second best bong i ever got from gogopipes if you dont already know gogopipes is a really good place to get bongs this bong is worth the price it should be 90$ my favorite mini bong. Comments: if you need a perc bong BUY THIS. 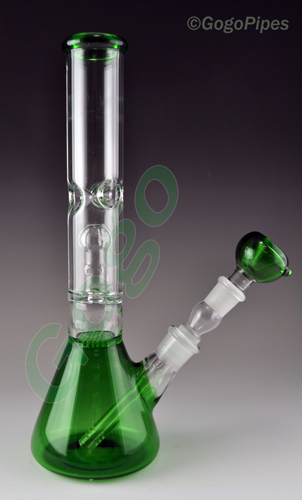 Pros: Perfect, thick glass, giant hits(tobacco), love the design at the top.